Finding new music can be a daunting thing. There’s so much of it and most of it is bad. And, conventional news outlets are either snobby or just flat-out-wrong (not us, of course). So if you want to be exposed to good new music, there’ a few things you can do. First, always take the advice of friends. Second, stick to a magazine that caters to your sensibilities. Third, dip into the releases of a label you know and love. It’s that exact formula that led me to Obnox and Niggative Approach, and I’m better off for it. The chances of me hearing Obnox would be close to zero if they were on any label other than the venerable 12XU. But, since they’re a label that’s worth their salt, I trust them. And, I was right. Or more so, they were right, because Obnox is just not the type of music I would normally listen to or would even know where to find. If I were to describe it I’d say, “the beats that accompany a rap song.” Poor description, I know, but not altogether wrong: Niggative Approach would definitely complement an MC’s rhymes. I’d doubt head honcho Lamont Thomas would like that very much, because this album is clearly a labor of love. What draws me to these songs is not just the novelty (for me), but the rawness, garage sound, and singular vision of Thomas. This isn’t some think tank garbage consisting of 120 producers and writers. This is one talented man driven by nothing but gumption, and that DIY approach can be heard throughout this album. It’s noise, hip-hop, and punk all at once. It’s got funk, R&B, and embellishments of horns and keyboards. It sounds probably unlike most of what you’re listening to, and it’s cool as hell. 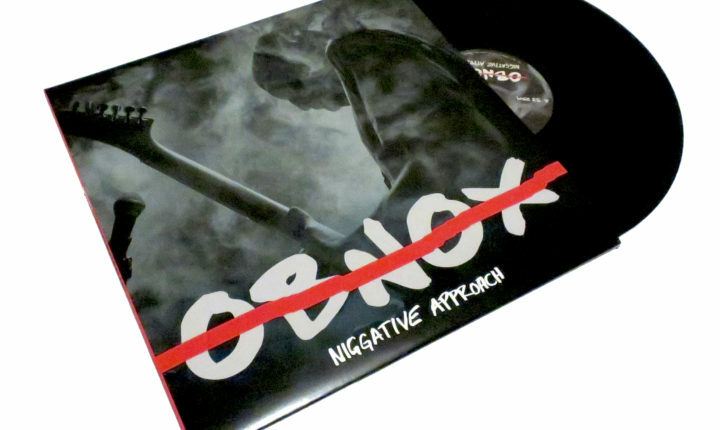 And of course, for that added level of noise, pick up the vinyl copy from the label itself. It’ll add grooves to an already groovy release.